The book of Isaiah is often called “the Fifth Gospel.” It is so rich and prophesies about every aspect of Christ’s life – his birth, his life, his passion, his death, and his resurrection. It is truly remarkable and comprehensive. It’s also long – the longest book in the bible. Isaiah can be divided into 2 main parts. Chapters 1-39: The book of judgment. (Summary: God’s people aren’t listening. They’re worshipping idols.) We’re in this part today – the early verses of chapter 35. – Did you know that the audience for St. Paul’s letters are non-Jews, whereas the audience for St. James (our 2nd reading today) are Jews? They are from Jewish descent but are now followers of Christ. The psalmist will likely sing this familiar tune, lifting his or her voice to the heavens and thus asking us to lift our hearts to God in all we do. Today we are asked to avoid judgment of others and partial treatment. That is, everyone you meet is a child of God. When it is hard to see God in someone else, ask yourself: “What does God see and love in this person? How can I focus on these qualities? Lord, help me to see this person as you do.” A priest told me that once and I never forgot it, I hope it has helped me be a bit more charitable when I see people who are not familiar to me or who don’t live similar lifestyles, such as homeless beggars on street corners. In short, God doesn’t have favorites. Today Jesus fulfills Isaiah 35, our first reading. After last’ weeks’ reading, Jesus goes on to heal 2 non-Jews, one of whom is deaf and mute – today’s Gospel. This is not a public miracle. Jesus pulls this man aside to heal him. Why? 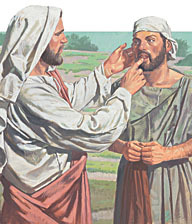 Scholars suggest that here we see how Jesus heals us each according to our ailments and our needs. Why? We don’t really know. Nor does it matter. What we can consider is that Jesus doesn’t do miracles for miracles’ sake. He heals persons – hearts, minds and bodies. He heals so that we might believe still deeper, so that we might love more richly, so that we might spread news of his hand in our lives and lead others to belief, too. How can Jesus heal you? Who may be in need of hearing a story of how God has worked in your life? This week we give thanks for the ongoing miracles of Jesus, and ask Him to reveal them to us more fully. May God bless your week!